AMMAN- HE Dr. Talal Abu-Ghazaleh, chairman of Talal Abu-Ghazaleh Organization (TAG-Org) thanked HE. Mr. Faisal Al Fayez for the invitation and stressed the fact that TAG-Org considers itself a partner in this field while also having the ability to cooperate and supply advice regarding the subject. 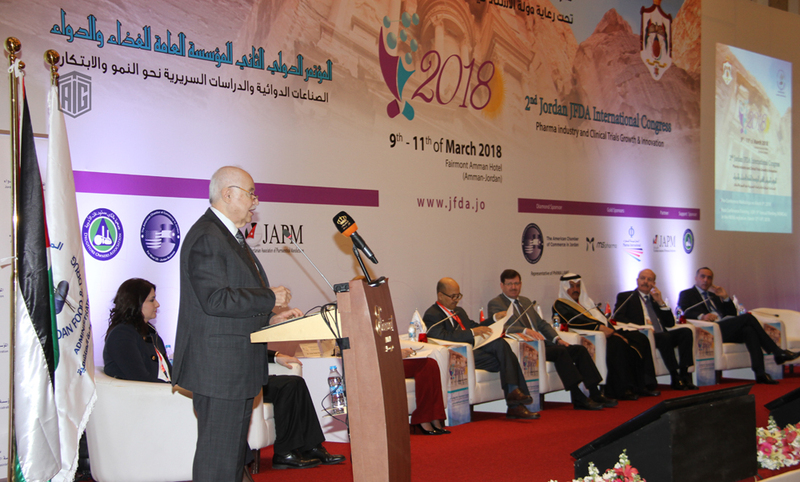 He later highlighted the need for establishing a taskforce to study the transformation of the Jordanian pharmaceutical industry to a knowledge-based industry, paving the way for a better future for the upcoming generations. Speaking at the 2nd Jordan Food & Drug Administration Congress held under the patronage of HE Mr. Faisal Al Fayez, President of the Jordanian Senate, Dr. Abu-Ghazaleh tackled the topics of the Pharmaceutical Industry locally and globally, Clinical Trials Growth and Innovation while stressing the importance of addressing various issues that are considered challenging. He also said that Jordan’s health sector has made excellent progress, but also claimed that it is not enough. He addressed the fact that the pharmaceutical sector is a key contributor of Jordan’s economy, seeing as 80% of the kingdoms’ pharmaceutical production is exported to over 60 global markets. In 2016, those sales totaled US$676 million while imports dropped by 10%. "Does the research in drugs benefit from expired patents for developing new drugs or settle with the old ones but use different names? Does the pharmaceutical industry really encourage innovation or does it seek to maintain its market with what it already has thus providing no encouragement to new innovations," Dr. Abu-Ghazaleh said. "Is there a need for a college for innovation in such an industry? We have established a college specialized in innovation where students cannot graduate unless they have presented an invention. The Talal Abu-Ghazaleh University College for Applied Business and IT (TAGUC) assists innovators in all aspects. This industry is based on innovation and clinical trials which lead to providing safe and effective drugs for all people," he said. TAGUC is an independent college dedicated to encouraging students to be innovative and creative by offering an unmatched support system that is necessary to create a suitable environment for students to succeed in the ever-challenging world of Information Technology. Dr. Abu-Ghazaleh further stressed the need for embracing ICT in the development of this industry saying: “Developing the pharmaceutical industry needs the use of the latest technology and we should ask ourselves if we are sufficiently embracing the power of ICT in the industry's research and inventions?”, citing the example of Abu-Ghazaleh Intellectual Property (AGIP) which did embrace the power of ICT and became the world leader in IP, filing more than 4000 pharmaceutical patents in the past five years. AGIP has won “The Best IP Advisor in Africa & the Middle East” as well as other prestigious awards and recognitions. They have also participated in IAM Pharma and BioTech IP Summit, which was held in London, UK, on the 8th of February 2018. Dr. Abu-Ghazaleh also questioned whether the patent protection period of 20 years is too long in this knowledge age. "I am on the board of the World Intellectual Property Organization (WIPO) where I asked the same question; do we need to continue with the 20-year-protection period which hinders new inventions or reduce it." He also stressed that patent protection is a necessary key to success and development and claimed that Market size and low risk of infringement do not mean that there is no need to protect your patent. Dr. Abu-Ghazaleh briefed the attendees on some of the future technologies; most importantly Artificial Intelligence (AI), a subject for which he holds much passion. Dr. Abu-Ghazaleh believes that the near future of industry will be dependent on AI, including the pharmaceutical industry. Globally, Dr. Abu-Ghazaleh asked if we need to study the Denmark model. "Pharmaceutical products are the single biggest export commodity from Denmark to the United States. Within the last decade, the export of Danish pharmaceutical products has more than tripled and we need to think why not Jordan? I propose the establishment of an Innovation Taskforce that will take this industry, the Jordanian pharmaceutical industry to another level," he stated. Around 300 local and international speakers and leading experts in the field of pharmaceutical took part in the two- day event held at the Fairmont Amman Hotel.